The idea was to work a little more abstractly than I do usually and in a way I hadn’t worked before. I like the idea of using my footsteps and then inferring the time which passes with the hour-glass, while the background was the sand as well. 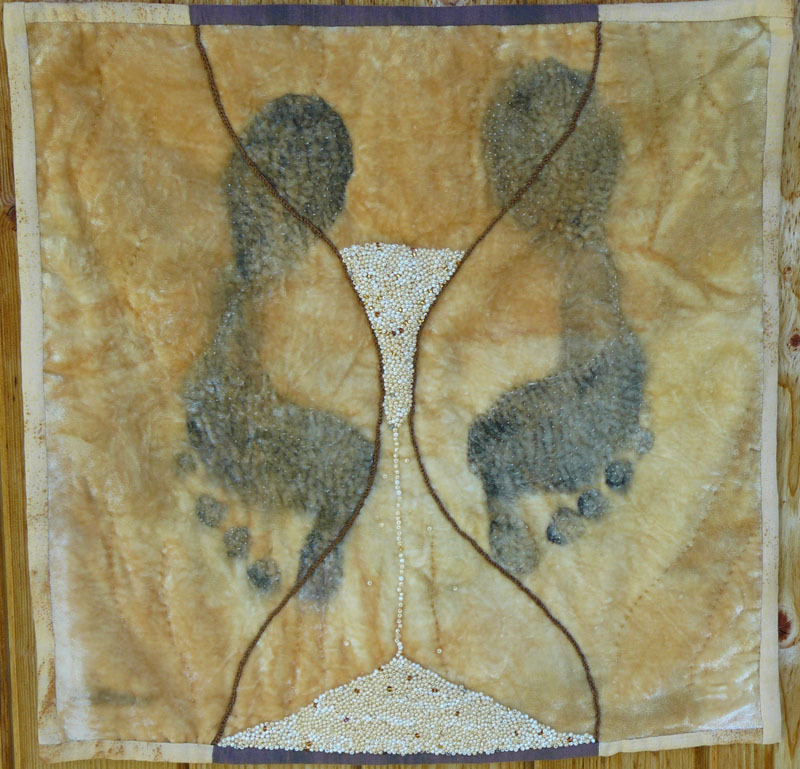 I used a silk/viscose velvet which I rust dyed before I added my footprints with fabric paint, the footsteps were then closely quilted to add more texture and mini patches of light. The surround of the hour-glass was finger knitted perle cotton and then the beads added for the sand. The background is lightly quilted along the natural dye lines; the binding is rust dyed and discharged cotton fabric. I was aiming at a simple effect. Simple is actually far from the word I would use to describe the process, I am passionate about silk but I have to say that this velvet tested my patience to the limit, velvet is not easy to work but this piece had a mind of its own, particularly when it came to adding the binding; I have never unpicked and re-sewn a binding so many times! On the whole I am satisfied with the result but it was an uphill learning curve. Next time I try printing with my feet I will be a little more organised, once one has one foot covered in paint one’s mobility is severely reduced and had I thought it over more carefully before painting the first foot I might have placed my feet slightly differently. The colour was slightly blacker than I meant, over zealous colour mixing meant I didn’t quite get the effect I was aiming for. By quilting the feet with small white stitching I wanted to lighten the effect and am quite happy with the result. The beading took rather longer than I had anticipated and rather more beads but on the whole I feel it worked. To be honest I don’t know what I would change, the effect I wanted to create has been achieved, the velvet has a light of its own and reacted very positively to the rust bath, maybe I skimped a bit on the size of the piece I dyed and as I have already mentioned I would position my feet differently another time. The image is not very square but the actual piece is; my photographic skills, or lack, of them are letting me down! This is such a stunningly wonderful idea which you’ve managed to carry through perfectly. I love it. I like this very much — especially the rust-dye piece (which is time-consuming and illustrates deterioration over time), and your foot prints. I wonder if denser quilting would have made the velvet behave a bit more…or stabilizer…And I like the beading but wonder if it could have been more abundant. Maybe you aren’t running out of time as quickly as you think? 😉 Thanks! I like the final result …but I would have liked to be a tiny mouse during the painting and printing of your feet !